For Newbie or Noob: If you are a new Blogger, you may have seen an email subscription form like the below one in many blogs while surfing. Email Subscription Form is form by which visitor of your site can subscribe to your content (Posts) via Email.When visitors subscribe to your blog, they will receive an email with your blog posts whenever your blog is updated. It makes blog look professional. By Activating Google AdSense for feeds you can increase your revenue. Step 1: Sign into your FeedBurner account. 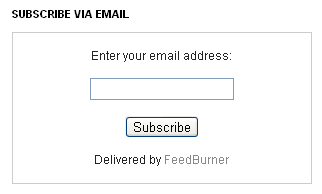 If you don't have an account in FeedBurner, you can register here. Step 4: Select Email Subscription in the left sidebar. For Subscription Form Code: Set language which is common for both and also select Blogger from the dropdown list and then click on button "Go" and you will be taken to your blogger account as shown in below image. Select a blog and title you like and then click "ADD WIDGET" button. For Subscription Link Code: Set language which is common for both and also select Blogger from the dropdown list and then click on button "Go" and you will be taken to your blogger account as shown in above image.Select a blog and title you like and then click "ADD WIDGET" button. At last check the Subscriber Managment checkbox to receive an email whenever people unsubscribe. Step 6: Click Save on Edit Layout and also on Subscription Management page. That's it, You successfully completed adding Email Subscription Form to Blog. 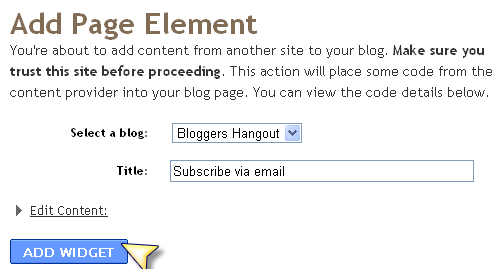 If you have any doubts about this post " How to add Email Subscription Form to Blog", please don't hesitate to comment. Hi Hemanth kumar thank you very much for providing such a wonderful information because it helped me a lot as i am new to this world of blog.